Stack A Restaurant’s unique, unrivalled setting located deep within the underground vaults of the CHQ building, creates the perfect ambience for an intimate meal for two lovebirds this Valentine’s weekend. The ultimate Valentine’s Day experience will begin for guests on arrival, as they are greeted with a complimentary Glendalough Rose Gin with Fever Tree Indian Tonic, Rose Petals, Strawberry, Dried Lemon and Thyme to set the mood for the romantic evening ahead. Diners will experience Stack A Restaurant’s signature style of locally-sourced Irish ingredients with globally-inspired flavour combinations as they choose from a selection of starters including Potato and White Truffle Soup; Earl Grey Tea Cured Venison Carpaccio; Sea Bream marinated in Herbs and Chardonnay Vinegar; and Baked Beetroot. 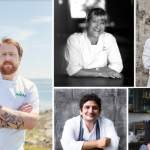 For the mains, diners will be offered a selection of dishes including Duo of Irish Beef; Pan Fried Supreme of Irish Chicken; Pan Fried Fillet of Hake; and Salt Baked Swede. Valentine’s Day is the perfect excuse to indulge, and for dessert guests can choose from Stack A Restaurant’s signature beer-infused Beeramisu; the Cheese of the Day; or the decadent Dark Chocolate and Passionfruit Fondant which is designed to be shared with your special someone. As an extra Valentine’s treat the meal will finish with two special “You+Me” yin and yang-style cocktails which have been specially created to perfectly complement one another, and to be shared with your other half. And the night doesn’t have to end there, couples can savour the romance and enjoy a cocktail or exclusive in-house brew cuddled-up together on Urban Brewing’s heated and sheltered outdoor terrace, taking in the stunning views of Dublin city. To find out more visit www.urbanbrewing.ie and follow Urban Brewing on social @ubrewingdublin, and Stack A Restaurant on Instagram @stack_a_restaurant and Twitter @stack_a_dublin.